Today I popped into my much beloved Rexall/Pharmaplus (that since my move I frequent less and less) to pick up a drink and after paying what do I see? 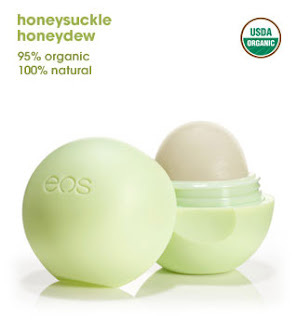 EOS lip balm on sale for $3.19, say what? I quickly grabbed one and annoyed the cashier with my second transaction. Woo hoo. I've been waiting to stubble across one of these forever, and what a good price. I tried it out and so far I love it. Feels great on the lips and smells so yummy. So happy.